MyOrthotics would not have been possible without Frank, because his case motivated me to understand how digital fabrication could be harnessed to improve his situation, find new combinations of traditional techniques for better results and eventually develop a fully functional orthosis that could help him overcome his disability. 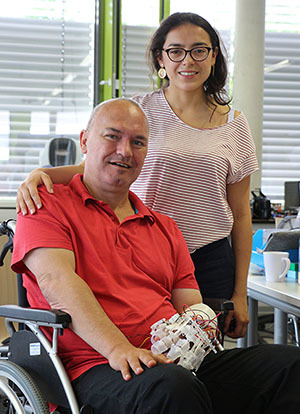 The process of going from a very abstract, technical level in FabLab and initial experiments to a working prototype was a surprising experience for Frank, but it also brought new hopes and anticipation for his new orthosis. Thanks to different types of visualisation (3D scans, models and finally a working prototype), Frank was able to experience and understand the full spectrum of the development process. Making the first prototype for my own hand put me in the patient’s shoes and gave me a new level of insight and appreciation for him, because it required me to simulate his disability for extensive testing purposes.